It feels rather strange that Microsoft has not redesigned the default Windows file browser Windows Explorer in past years. Some features like the breadcrumb navigation have been added, but the core usability issues have been left untouched. Windows Explorer lacks for instance a way to switch between multiple folders elegantly. Most users open multiple Windows Explorer windows to copy or move files comfortably between folders. 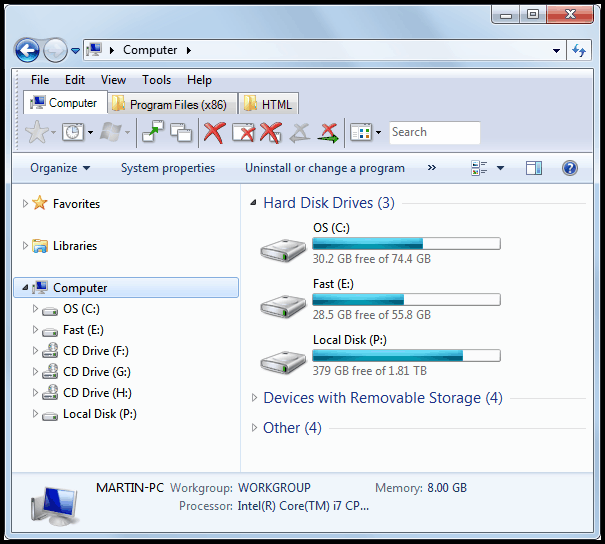 Others use third party tools that feature a multi-folder interface. Tabs are another option, and most users would surely have no difficulties adjusting to tabs in Windows Explorer, considering that most should have tab experience from Internet browsing. QTTabBar was a popular extension back in the Windows XP days that added tabbed browsing to Windows Explorer. The project was stopped at one point in time, some say because the original Japanese developer died. The consequences were that development stopped, and that the tool remained incompatible with Microsoft's newest operating system Windows 7. Another developer finally decided to take over the development of the tabbed browsing solution for Windows Explorer. Initial goals were to make the program compatible with Windows 7, and to fix bugs and issues to improve program stability. First alpha releases were offered some time later, which still had issues that prevented the installation on productive systems. The alphas showed a lot of promise on the other hand. The first beta of QTTabBar 1.5 was released two weeks ago, and this version appears to be stable enough for most systems. Installation of QTTabBar is straightforward, and user interaction is kept to a minimum. Tabs are automatically added to Windows Explorer after installation, a restart of the system is not required. When you open Windows Explorer for the first time after program installation, you notice that the header area has been modified to accommodate the tabs and other new features added by the program. The program displays the standard Windows Explorer toolbars at the top, namely the navigational toolbar with folder path, back and forward buttons, and search, and the menubar. 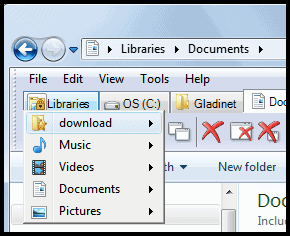 Two need toolbar are added below, the first displaying the open tabs that point to different folders on the computer and a feature bar with icons to quickly access specific program features. Here it is for instance possible to access recently closed folders, add applications to a quick start list (via drag and drop) or open a folder group. A folder group is basically a listing of multiple folders that can be all opened together with a click on the group icon. The placement and availability of icons and features, and even of the feature bar can be modified in the program options. The toolbar can be removed completely if its functionality is not needed or if space is a requirement. Tabs are added to the program with a double-click, or via drag and drop. Tabs can be locked which effectively sets the current folder as the root folder of that tab. Another interesting feature is the ability to display sub-folders directly with a click on the tab icons. 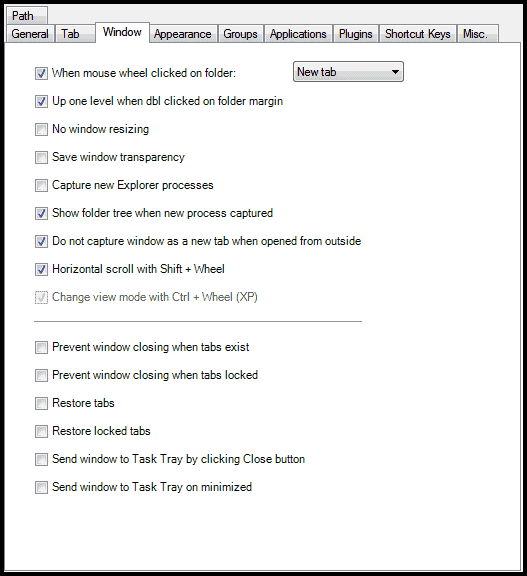 QTTabBar can remember pinned and open tabs if the setting is activated in the options. The program options are very detailed. It ranges from configurable hotkeys for every possible action, over tab navigation and creation options to appearance changes and configuration of the groups and applications feature. QTTabBar feels very stable at this point in development. I did not notice stability issues during tests on my Windows 7 Professional PC. Interested users can download the first beta of QTTabBar from the project website over at Sourceforge. This is the best thing to happen to explorer, just turn off those ugly buttons until they receive a workover. That is really helpfull addition. If I only could hide that Windows Explorer part “Organize”, “System properties” and so on. Totally useless for me. Anyone tried Q-Dir? It’s quad explorer with tabs and a lot of features. It’s just a single file (portable). I use it next to the standard explorer. Yes, but QDir has a peculiar habit of crashing whenever a USB drive was last opened in a window but is unplugged when opening the program. I changed to ExplorerXP, which has a simpler interface. This is a dual pane file explorer. I have developed Clover, now it was released with version 2.0.106. 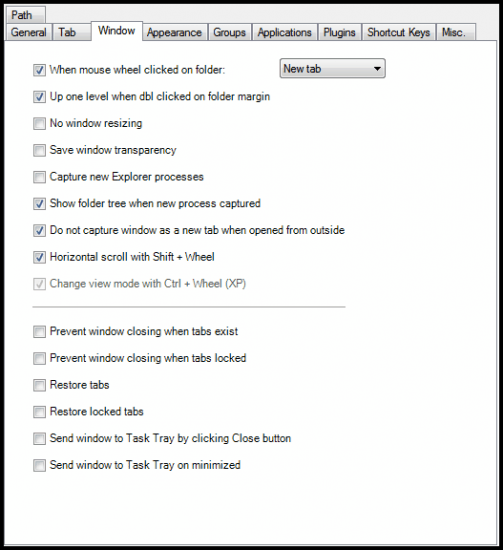 Clover add Chrome like Tab to your Windows Explorer. Clover was integrated into Windows Explorer so when you open Explorer, It was launched with Tab bar on the title. And you can Add new tab/ Close tab / Drag tab in the tab bar easily. Thank you, If you can, please help recommended Clover on your software blog, or introduce to friends.I hope more people can use this free software.